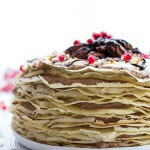 Today we are talking about one of my favorite cake recipes. This is my grandma’s signature summer cake and it is also one of my dad’s favorites. Come to think of it, it’s probably my brother Brendan’s favorite too, considering he ate most of this cake. It’s just so good, you really can’t beat the flavor combo, and of course ice cream cake in the middle of summer is always a crowd pleaser. Ice cream simply = summer. Here’s the thing about my Nonnie, she is a great cook, but she doesn’t like to cook anything that will take too long or has too many ingredients. So while her recipes are delicious, they are also simple, which is actually pretty awesome. Also, I should mention that while she does love to cook, her favorite thing is going out. If she could, I am pretty sure she would go out to eat for every meal, which is so different from me. I love eating in and making my own food. For me, it’s probably a total control issue, since I need to feel somewhat in control at all times. Well that, and I really, really like knowing what is actually going into my food. I know, I am so crazy. Pretty sure my Nonnie thinks I am cray too. Anyway, we have been doing a lot of eating out. I am currently trying to convince her that we should have leftovers before we head out to shop, but it’s not flying over so well. Oh well, lunch out it is! Back to this cake though. 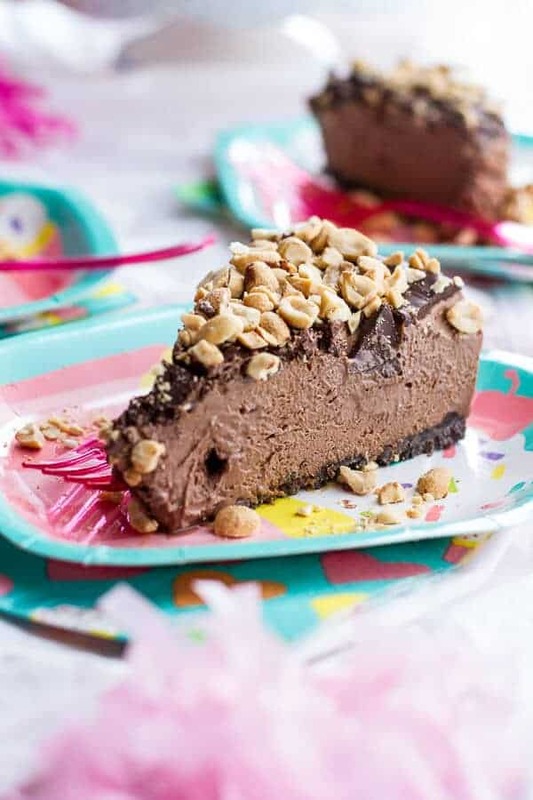 The way Nonnie makes this is with only 5 ingredients. I added 2 more ingredients since I made my own chocolate shell. Either way you go, you are going to love this cake. And I really do mean love it. 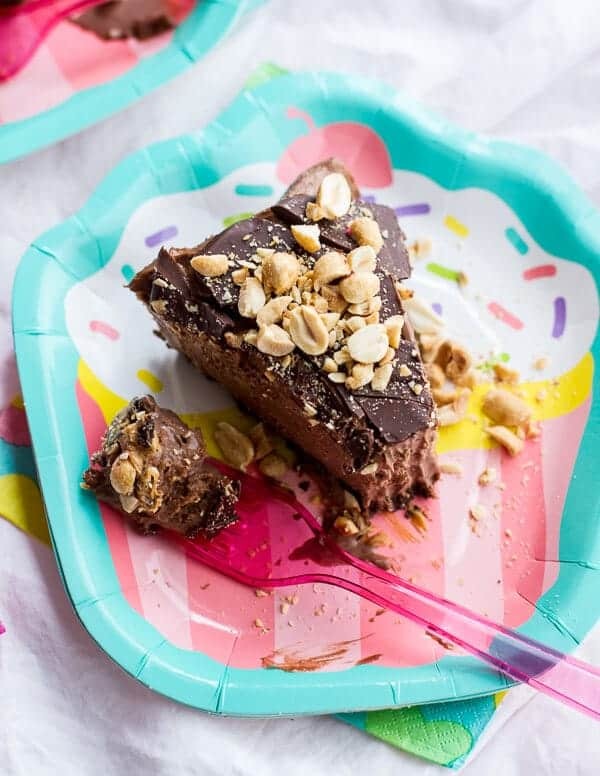 All this cake consists of is a chocolate cookie crust, mixed with homemade or store-bought chocolate ice cream and an entire 16 ounce container of peanut butter. Then just add the ice cream to the crust and freeze. That’s it! Well actually, you need to add the chocolate shell once the cake is frozen, but that literally takes just seconds. SO this is obviously perfect for any summer occasion. Oh, and Asher says to tell you that it would also be perfect for an outside summer afternoon snack… or breakfast. Oh to be five! 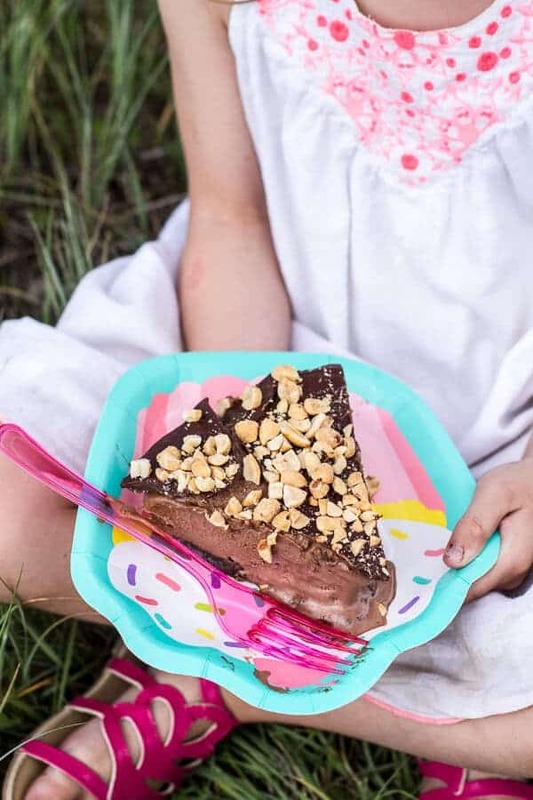 You really can't beat the flavor combo, and of course ice cream cake in the middle of summer is always a crowd pleaser. Remove the ice cream from the freezer and allow it to sit on the counter 10-12 minutes, but no longer or you will end up with an icy cake. Grease an 8 to 9 inch round spring form pan with cooking spray. In the bowl of a food processor add the cookies and pulse until you have fine crumbs. Add the melted butter and pulse until combined. Dump the cookie mixture out into the prepared spring form pan and use your hands to press the cookies into the bottom of the pan until you have a smooth and even crust. Spoon the peanut butter into a microwave safe bowl and microwave on high for 15-20 seconds or until lightly melted and somewhat pourable. Add the ice cream and peanut butter to a large mixing bowl or bowl of a stand mixer. 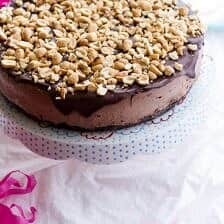 Using a spatula or the beater attachment to your mixer, mix the ice cream and peanut together until almost no streaks of peanut butter remain (I prefer using my stand mixer for this). It does not need to be perfect or smooth. Just work quick so the ice cream does not completely melt. Pour the ice cream right on top of the crust and smooth it out so it is in an even layer. 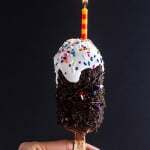 Cover the cake with plastic wrap, pressing the wrap against the ice cream to help prevent ice from forming. Freeze for 4-6 hours or overnight. Before serving remove the cake from the freezer and pour the magic shell over the cake, allowing some of the shell to drip over the sides. Immediately add the chopped peanuts. Once the shell hardens you can slice and serve or place it back in the freezer until ready to serve. Just be sure to remove the cake from the freezer 10 minutes prior to cutting. Promise it makes cutting the cake so much easier! Combine chopped chocolate and coconut oil in a medium sauce pan over medium heat. Stir frequently until chocolate is almost melted. Remove from heat and stir until completely melted and smooth. *If you do not have a food processor just add the cookie crumbs to a large ziplock bag and use a hammer to smash the cookies into crumbs (or simply place the bag on the floor and step on it). Ok, off to lunch with Nonnie! You have a very cool and awesome Nonnie! 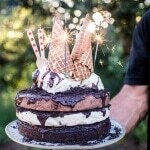 :* This ice cream cake looks AH-MAY-ZING!!!!! That chocolate shell topping looks DELISH and an entire jar of peanut butter ??? PLEASE, SIGN ME UP! I’m already drooling all over my screen! Why is peanut butter and chocolate such an amazing combination???!?! Cute cake plate by the way! 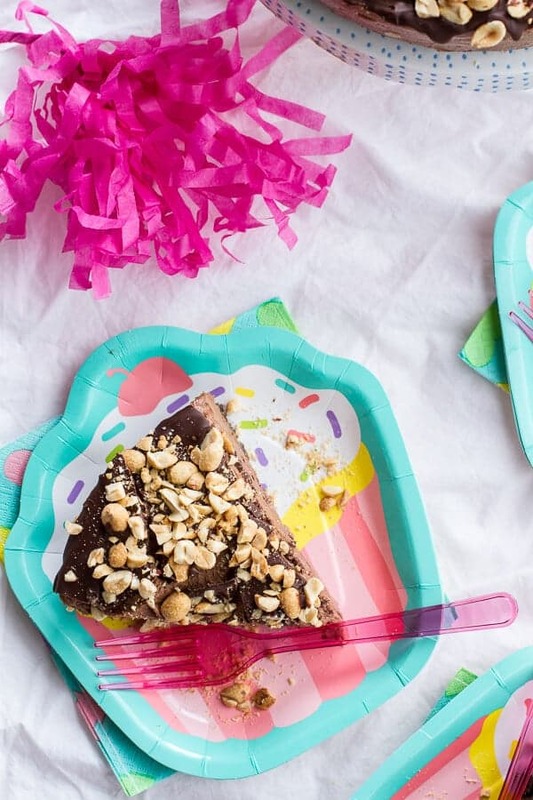 Ice cream cake might be my favorite and it sounds like this one would be amazing! Ice cream cake makes me so happy. 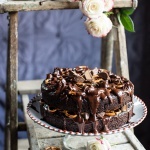 This recipe is lovely! This is such a simple recipe can’t wait to try it. Asher’s piece is huge oh to have the metabolism of a five year old. Love the cake stand so cute. 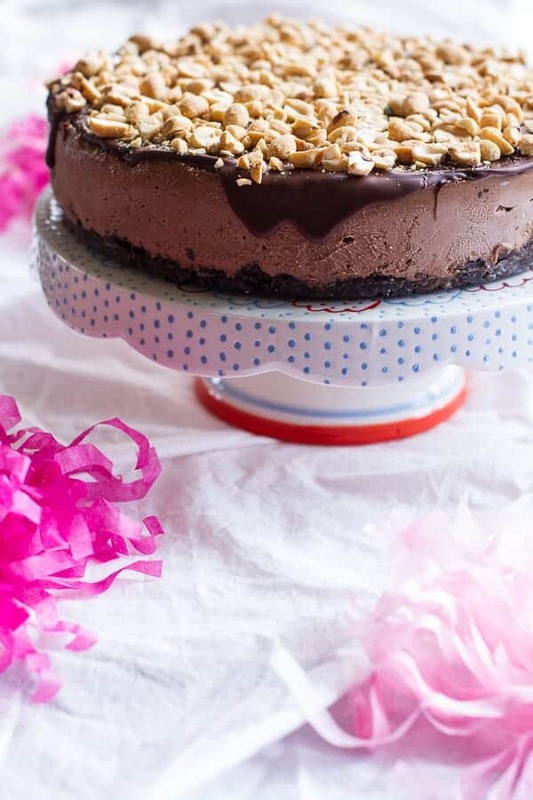 Peanut butter + chocolate = love, there’s no two ways about it! 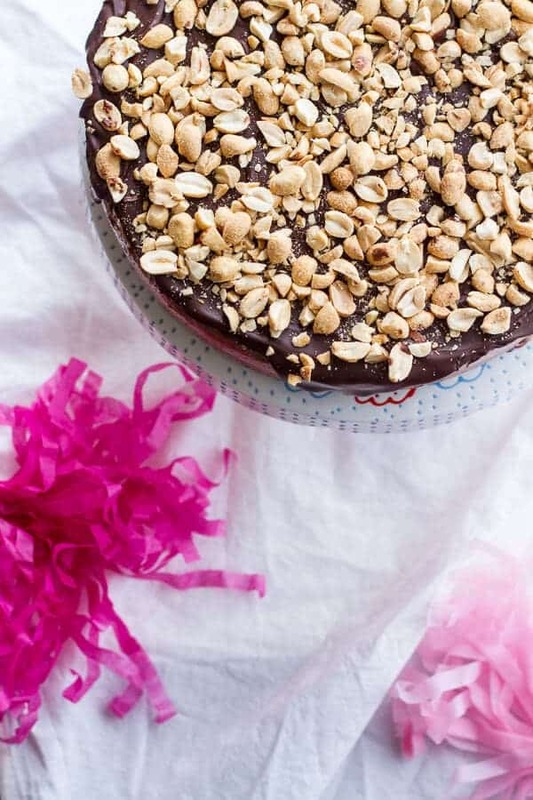 And with the peanut topping, this cake looks divine! I love the way Asher thinks…breakfast it is! Grandmas make the best food! 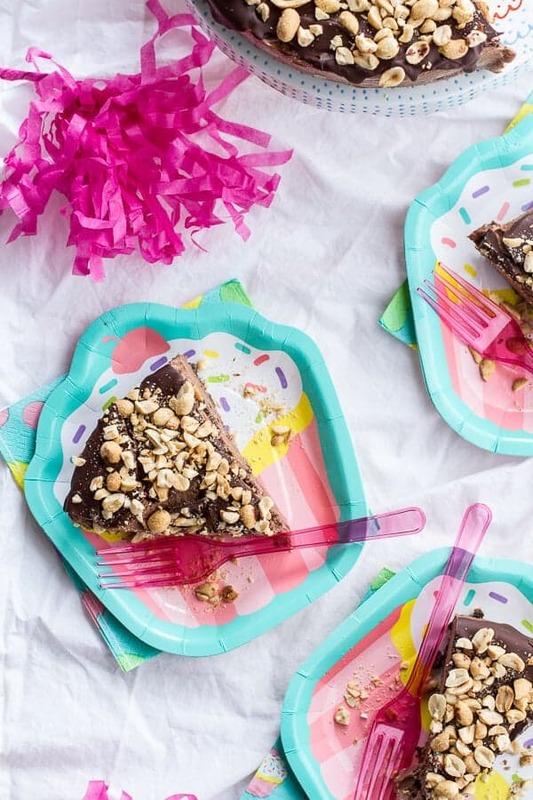 This is a recipe for ice cream cake that I can handle! Love the small list of ingredients and the simplicity of it all. Thanks Tieghan! You have always very cool and awesome recipes, Tieghan! 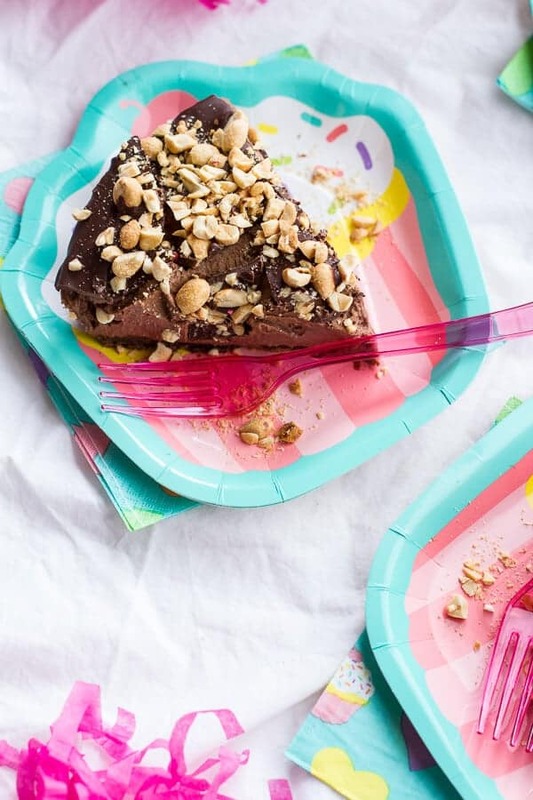 This ice cream cake looks amazing! Oh how yummy and only 5 ingredients! LOVE this easy and delish recipe! Great for a summer party! Love this! 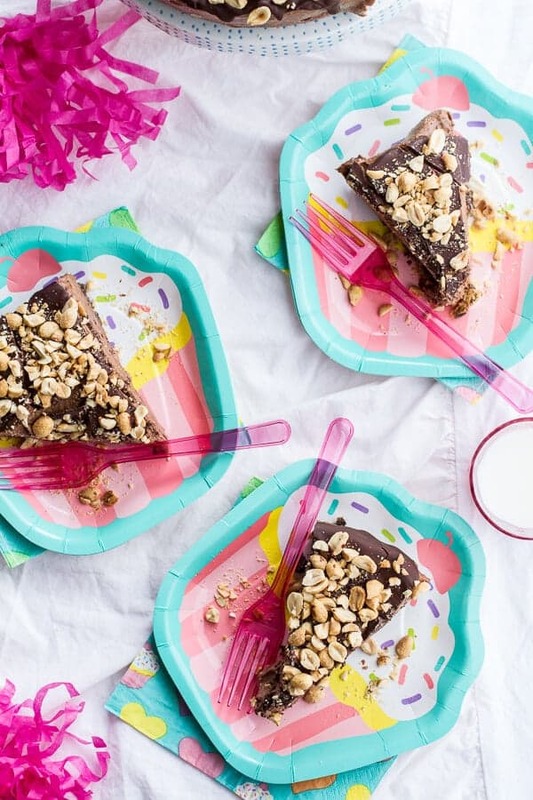 So fun and simple–the perfect summer dessert. Those plates are adorable, btw. 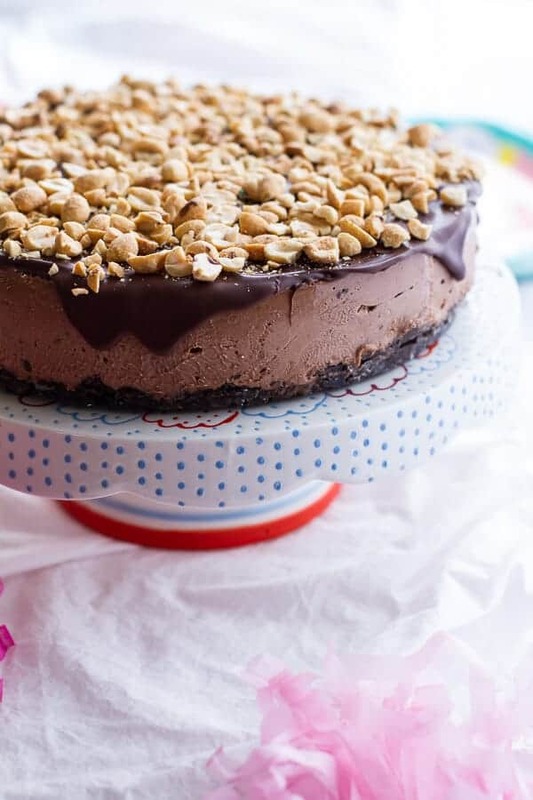 That looks amazingly decadent and I love me a good chocolate cookie crust!! 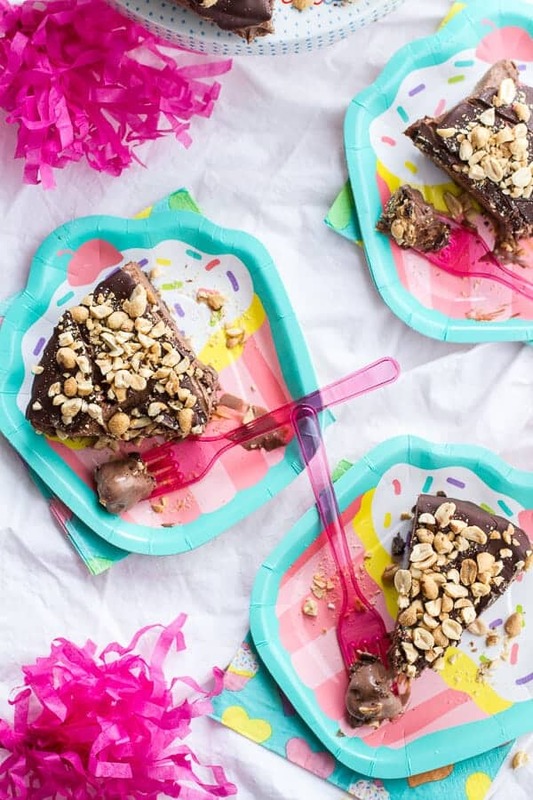 What an amazing ice cream cake that just screams SUMMER!!! seriously, this looks amazing! plus, it’s peanut butter and chocolate ice cream. love it! I do love this cake and haven’t even eaten it yet. The peanuts on top make me swoon. 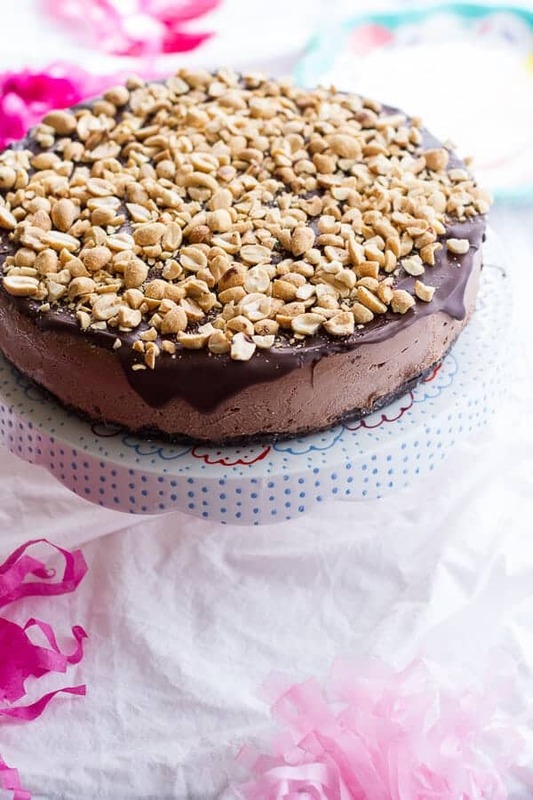 PB + chocolate + ice cream + pie = deliciousness! I so need this cake in my life! And yes, to be 5 with a matching metabolism, too ;). Lucky girl – this would make a fine breakfast! Your bonnie is one smart lady! Simple but delicious recipes are the best. I love love love this cake!! I am not sure I would call this a ‘cake’ exactly. But I would definitely call this delicious. OMG! Awesome! Tieghan, I made this yesterday for a World Cup gathering for my college age kids, and am officially the most popular mother in the DC metro area. This creation is simply amazing. Thank you and thank your Nonnie! i love chocolate and pb pie. this looks great! What a beautiful creation! Mine wouldn’t stay in the freezer long enough to freeze! Hello, I think this looks really yummy! Do you use a 16oz jar of peanut butter in the recipe? Just wanted to make sure. Thank you! Looks delish!! How far in advance do you think I can make this? TIA!! What type of wafer cookies are you referencing in your recipe? Excited to make this for a game day gathering !